A couple look over a collection of English Marigolds at the Brooklyn Botanic Garden. 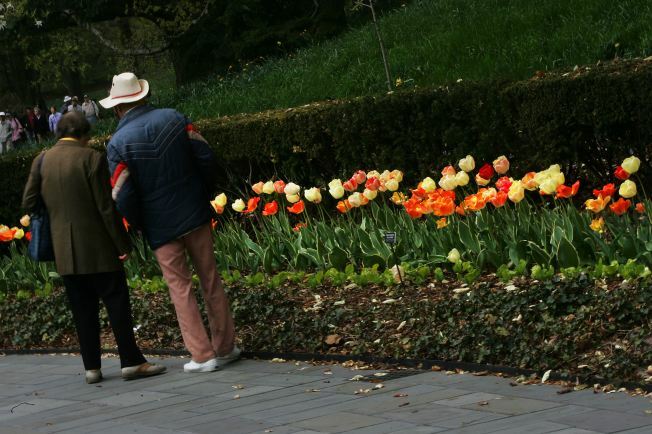 These are the final days of the winter weekday-freebies at the Brooklyn Botanic Garden . In the winter, the $8 admission is waived every weekday. Starting next week, the gardens flip back to regular admission rates. but even then, you can still get in for free on Tuesdays, and on Saturdays before noon. Blooming in March will be the forsythias, Crocuses, Witch-hazels as well as orchids and South African bulbs in the indoor gardens. The first cherry blossoms are about a month away. The weekend of May 2 and 3 is when the garden will host its 28th annual Sakura Matsuri festival, celebrating the blossoms on the 220-plus cherry trees in the 52-acre garden located next to the Brooklyn Museum. See NewYorkology for a list of other free days at gardens, museums and zoos.